Hi there! Before I moved to New York, I had no idea what Cinco De Mayo was. Apparently, it is a huge deal in the food blogging world and just in general. And why wouldn't it be? I mean hello tequila, mezcal, tacos, tons of chips and guacamole to celebrate. Count me in!! 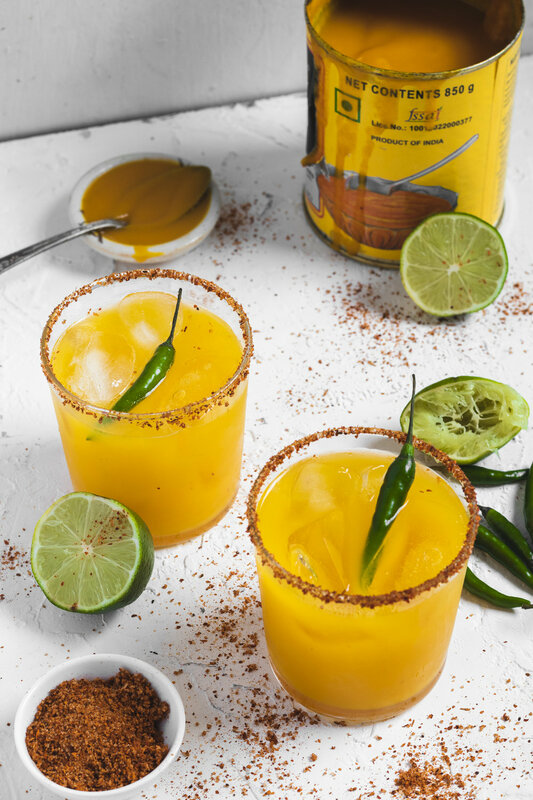 I know you are wondering whats so special about these margaritas, well it's the alphonso mango pulp used. These mangos take me back to summers in India when my parents ordered these by the dozens. They are juicy, delicious and a box full will make your home smell like heaven. I don't have the luxury of eating them fresh anymore, because I cant find these mangos anywhere in the states. So I settle for the pulp which is just as satisfying. I am bringing these to a Cinco de Mayo party on Instagram to share with everyone on there!! 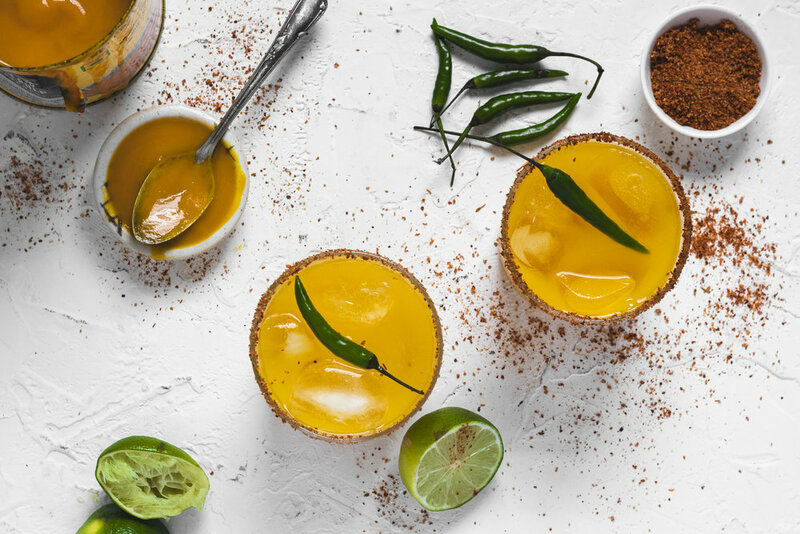 Run a lime wedge against glass rim and dip into a shallow bowl filled with mixed tajin salt powder. 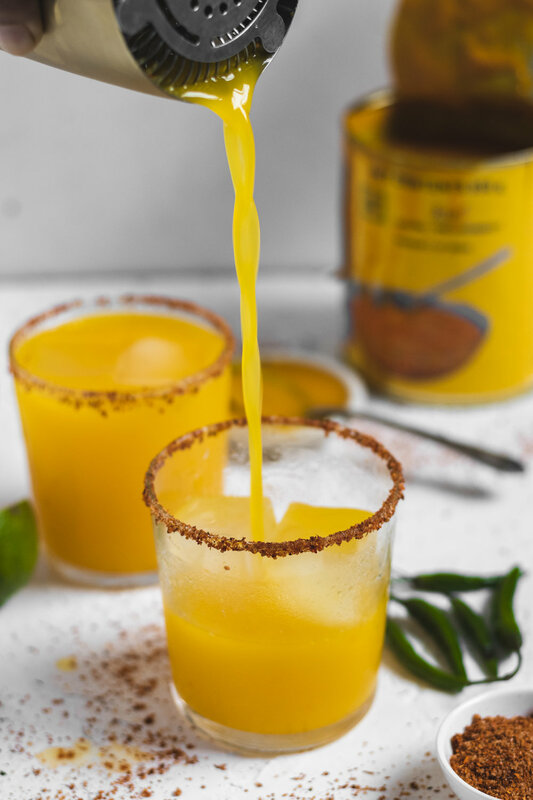 Fill a shaker full of regular ice and add lime juice, triple sec, tequila, simple syrup, mango pulp and 1/2 a chilli and shake well for 30 seconds. Strain into (2) margarita glasses filled with ice. Enjoy cold, cheers! !